La Salle High School football coach Russell Gordon, after the Lancers suffered a heartbreaking loss in the first round of last season’s CIF-Southern Section playoffs, stepped up his team’s schedule in hopes of hardening them while using it as a barometer of where they stand. 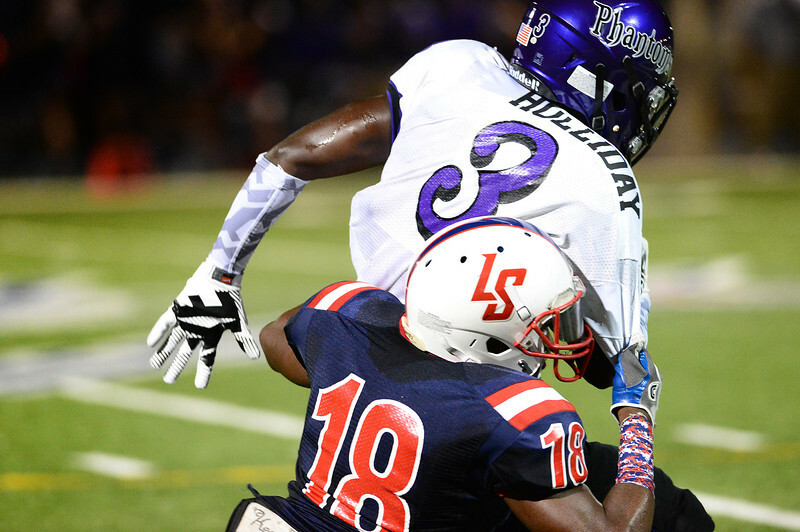 Time holds the answer for the former, while La Salle showed at times Friday that it’s not too far off from the latter, pushing Cathedral before losing 34-9 in both teams’ season opener at La Salle High. 3. Rio Hondo Prep (1-0) def. Brentwood, 36-6 — Kares don’t miss a beat. But Mission Prep looms next week. 7. Temple City (0-1) lost to Simi Valley, 55-2 — A slow start for Rams…but remember last year? 8. Maranatha (1-0) def. Bassett, 41-21 — Nice way to begin the Jude Oliva era. 10. Flintridge Prep (0-1) lost to Army-Navy, 42-41 — A-N edges the Rebels for the second consecutive year. The Contest: Once again, Keith Lair and I will go head-to-head picking football games throughout the season. This week: Week 0 has some interesting matchups, highlighted by La Salle’s step up game at home vs. Cathedral. The Phantoms were 10-3 last season, finishing third in the tough Mission League and advancing to the Western Division semifinals. La Salle had a breakout season last year, but they might be overmatched in this game. Other notable games are Alhambra vs. Arcadia, which pits two new coaching staffs; Ganesha at Keppel, which could surprise people with transfer quarterback Marqus Valenzuela, and Rio Hondo Prep, seeking a three-peat in the Northeast Division, opening up at Brentwood. Second-year La Salle football coach promised to step up the Lancers’ slate this season, and he’s given his team a big-time challenge in the opener. La Salle, fresh off finishing 10-1 with a Del Rey League championship, opens the 2013 season Friday with a home game against Cathedral. The Phantoms finished a solid third in the tough Mission League and advanced to the Western Division semifinals last season. Here’s our two-minute drill preview video. Can you guess who Aram and I picked? La Salle High School boys basketball coach Jelani Gardner resigned on Tuesday, citing differences with school administrators. “His resignation was based on unresolved differences in the basketball program administration and style and is a result of extensive and thorough reviews and evaluations of the program.” athletic director Anthony Harris said. Gardner, in his only year with the Lancers, started two talented freshmen, Vance Jackson and Milan Acquuah. The Lancers went 14-10 and lost to St. Genevieve, 75-60, in the first round of the CIF-Southern Section playoffs. Gardner was a standout player at St. John Bosco. He played at Cal and Pepperdine.